On Friday I flew in to Charleston, SC and had a sweet reunion with TJ. We hadn't seen each other in almost a month and that is much too long in my opinion. Fortunately we had a lot of time to properly catch up during the 4 hour car ride to Lake Keowee. I talked his ear off until we pulled into the driveway of his lake house around midnight. His parents had waited up and fed us dinner before we all called it a night- we had a long day of tailgating and football ahead of us. TJ surprised me by getting tickets to the Clemson v. Georgia game last minute, they were selling like crazy since it was the first game of the season and a huge rivalry. I had never been to a big football game before. I mean I had been to one NFL game before, a Jets game, but the feel and the emotion and excitement of a big college football game, especially one in the South, is a completely different story. When I was in college I used to really enjoy tailgating and getting dressed up for games (do you do this or is it just a southern thing?) and walking around "the mall". But our university's football games were the opposite of Clemson football game. For starters it was a dry campus, and there was about one twelfth as many people. Plus, our team wasn't that great and the students generally left at half time. 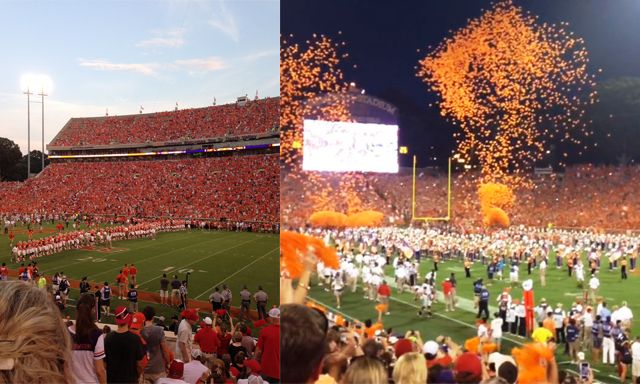 Needless to say, I was unprepared for the experience of a Clemson football game. We started out the day with french toast while we watched ESPN College Game Day- hosted at Clemson. 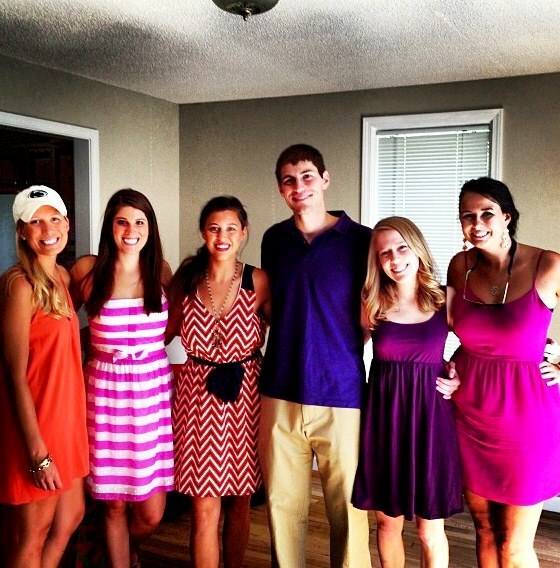 As a few more of our friends arrived we donned purple and orange, packed our coolers and headed into town. We parked more than a mile away from all the activity knowing that it would be much easier to get out once the game was over that night. TJ and I separated from the other girls and headed to meet up with one of his best friends from high school. 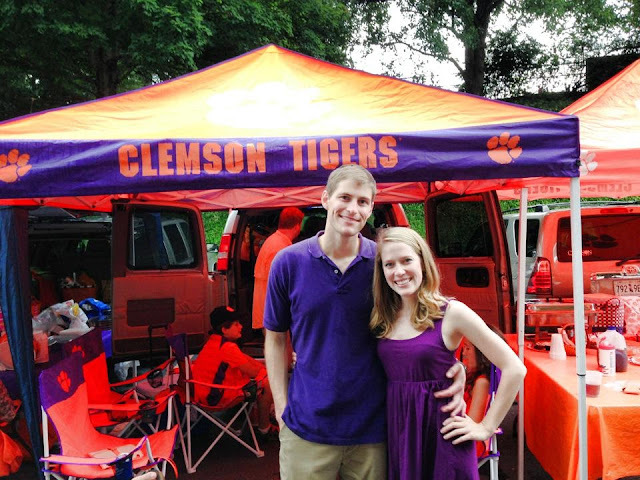 His family had a prime tailgate spot right by the stadium-complete with a TV hooked up to their van for pre-game coverage viewing, platters of chick-fil-a nuggets, hot dogs and strawberry cake in the shape of a tiger paw. It was so fun for me to get to meet some of TJ's old friends and hear stories from his growing up days,TJ has been going to Clemson games since he was a little boy, (plus I just love being introduced as his girlfriend). The crowd all day was insane! I really can't imagine what it would have been like to go to Clemson as a student- and it was actually one of the schools I applied to and visited. To have the campus be that crazy (and trashed) every weekend, well...it's hard to know how anyone does anything productive. Finally it was time to make our way into Death Valley. We actually had really great seats, and although we were a little too close to the Georgia marching band for our liking, there were very view Bulldog fans near us. Did you know that when the Clemson team runs down The Hill, past Howard's Rock and charges into the stadium at the start of the game, it's known as the 25 most exciting seconds in college football? That was how TJ set it up for me and I was not disappointed. Fireworks, orange balloons, the anticipation, the band, and 87,000 fans screaming C-L-E-M-S-O-N. I can't imagine how hyped out those players must have felt. I've never really been someone who enjoyed watching football before (let alone reading a long blog post about it). I never really understood the rules or got into the action of the plays. But clearly that was because I've never seen a football game like the one I saw on Saturday. I did not know what I was missing out on. I was jumping up and down, high-fiving strangers, biting my nails when it got too close, screaming whenever they dropped the ball or recovered a fumble. It was a blast and thankfully Clemson won! I would not have liked to see that crowd angry. At the end of the game the student section rushed the field. The rest of the Labor Day weekend was much more low key. Sunday we slept in and then spent the day relaxing on the lake, floating on rafts, sitting in rocking chairs and watching a thunderstorm roll in. It was just my kind of day. Unfortunately TJ had to work on Monday so he dropped me off at my sister's apartment and headed back to Charleston. I hated seeing him go but I did love getting to spend some extra time with my sis. The two of us went out and grabbed a yummy dinner followed by some Yogurt Mountain which we enjoyed while watching Sister Wives (it's a train wreck we both enjoy). On Monday we gabbed over bagels at Panera and then wandered around the absolute cutest shop in the South, Swoozies. 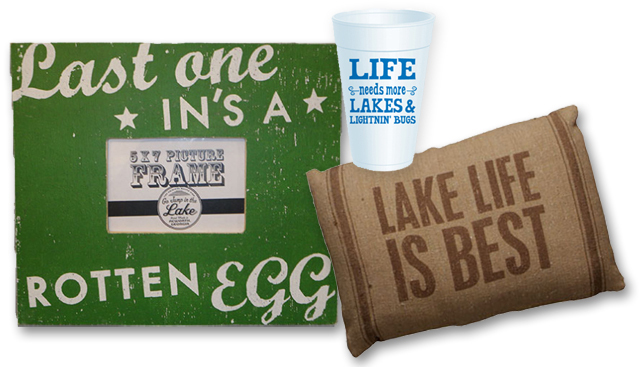 I could have literally bought everything in there but I especially wanted all these cute lake items and a lake house of my own to put them in. Sister just started her first teaching job (I posted about this here) and she was eager to show me all her lesson plans and her roster. After she filled me in on all the 3rd grade drama we drove out to see our Aunt, Uncle and cousin, who live not too far away, for some bbq chicken and macaroni and cheese (which my cousin made using a recipe from the Beanie Baby Hand Book, it's a real thing) . When I was in college it was so nice having them close by whenever I needed a home cooked meal or an escape from campus and I was glad I got to visit with them, catch up on life, and play a few rounds of Scattegories before I had to catch my flight home. 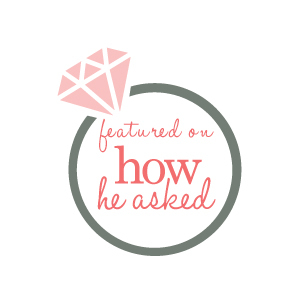 Sorry this was such a long recap but I didn't want to forget a minute of this fun weekend. It was just chock full of the most important and simple things in life: family, friends, good food and evidently football.